The President of India, Shri Pranab Mukherjee inaugurated the new building complex of Jagat Taran Girls Inter College and unveiled the statue of late Shri Chintamani Ghosh at Allahabad today (December 25, 2013). 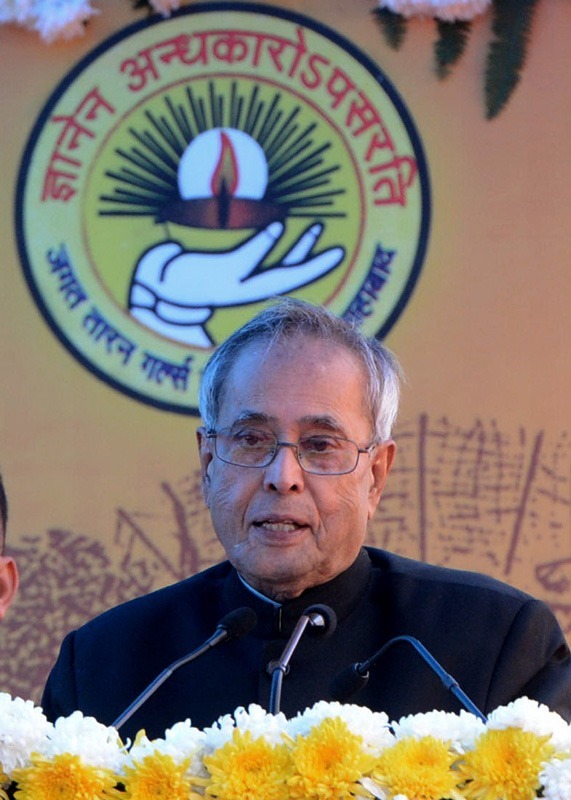 After unveiling the statue of late Shri Chintamani Ghosh, the President said that Shri Ghosh made great contribution towards promoting Hindi language and literature and in publishing the first Hindi monthly magazine 'Saraswati'. Speaking on the occasion, the President stated that education being imparted in schools will lay the foundation of India's future. He said that the youth are the builders of our future and of the nation. We will have to make them the medium for change and development through education. He stated that children should be taught that they should not merely be good students but should also inculcate in themselves the desire and energy to serve society. The President emphasized on the need to increase the education and literacy levels of women. He said that schools will have to prepare aware citizens who respect humanity and rise above the feeling of hatred, violence and discrimination to contribute in the development of a strong and vibrant nation. Among the dignitaries present on the occasion was Governor of Uttar Pradesh, Shri B.L. Joshi. The President also inaugurated the 86th Annual Convention of Nikhil Bharat Banga Sahitya Sammelan at Allahabad earlier in the day.